THIS TIME OF year hereabouts everyone goes nuts for flor de calabaza, pumpkin flower, or maybe it’s squash in English. Don’t know, don’t care. Irrelevant. The interesting thing is that the locals go nuts about it. They eat it in every possible form. They crow about it on restaurant menus. The fact that it’s seasonable just boosts the allure. As you can see, it’s a very pretty flower. That’s my child bride holding a bouquet she bought in the neighborhood plaza this morning while we were doing our exercise walk. She paid 10 pesos, which is about fifty cents U.S. When flor de calabaza is included in a recipe for whatever and cooked, it loses its beauty entirely, but that does not reduce its popularity one bit. Flor de calabaza has no taste whatsoever. None. The king is parading in the streets buck naked, and everyone is oooing and ahhing at his raiment. And not only that, as I mention above, when it’s cooked it loses its loveliness. Flor de calabaza is a beautiful flower. And it’s edible. This means its beauty must also make it tasty. ‘Fraid not. 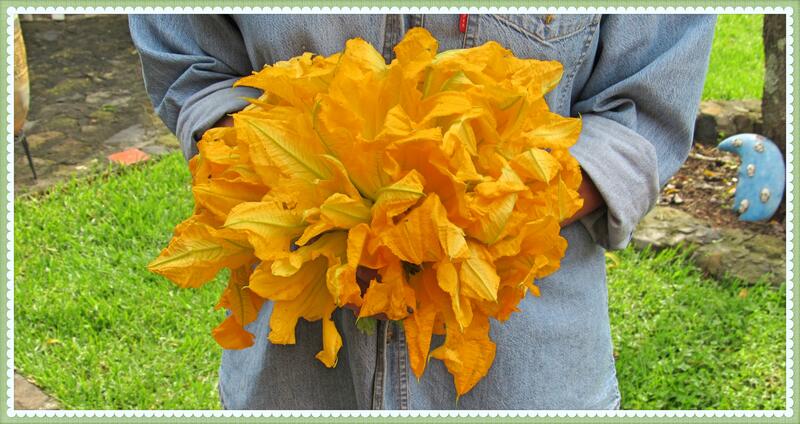 So flor de calabaza is merely an idea, a notion, a myth of sorts. I often say Mexican life is like Alice’s Wonderland, and this is a lovely — but tasteless — example. Don’t tell anyone I wrote this. Por favor. Now that you mention it, no squash has any particular flavor. Like the flower, it’s just there. Really, have you ever seen anything labelled “squash-flavored”? Good one, Ms. Shoes. Squash-flavored. Nope, never have, never will. As for its being “just there,” you cannot even say that for the beauty of the flor de calabasa after it’s cooked. Estamos de acuerdo! Ja ja ja! Mike: The best use for this flower is in a vase with water. It is pretty. Well, until it’s cooked. Then, not so much. Thank you! If I’ve ever had it in any food I don’t remember, so just recently seeing recipes in Bon Appétit, and seeing them in the mercado in GDL, I wondered what they tasted like. Now I know. Yep, Angeline, now you know. They don’t taste like anything at all. Nada. PS: In Bon Appétit? Lordy. Just goes to demonstrate the power of a myth. A story on Oaxaca. Seems to be the Mecca. Angeline: I’ve never been to Oaxaca. I guess I should go one day. It’s a good distance south of me. It’s probably improved, but when I moved here and for a number of years after — maybe still is — there was no convenient way to get there from where I am. There’s terrific bus service from CDMX. Just do a twofer and spend some time in CDMX both coming and going, and it’ll be as easy as pie. Kim: One day, one day, maybe. I’d more more drawn there were the place not so often in civil turmoil. I read a news story just a few days ago that the garbage had not been picked up in a week or so. Protests about pretty much everything. You are referring to Oaxaca? Or CDMX? I’ve got to imagine it’s the former. F and I went there in 2012 and it was pretty tranquil. But I had read plenty of things about violence prior — school teachers if I remember correctly. So you have to pick your time carefully. Kim: Oaxaca, of course. Mexico City is another matter altogether, and so large you can usually detour around the nuts. Interjet has inexpensive flights from Mexico City to Oaxaca.Takes just over 1 hour. Of course there’s the time consumed in check-in and passing the security gauntlet. Don Cuevas: Oh, I know one can fly to Oaxaca. Maybe one day. Don’t forget that you also miss the chills and thrills of being in a bus, piloted WAY too fast over twisty mountain roads. There’s no way the airlines can compete with that. You’re supposed to stuff them with something tasty and then saute or fry them. It’s like a wonton wrapper or those things they use to roll up spring rolls. Well, that is true, Loulou. It sometimes is used as a wrapping, but do people go bananas when wonton paper or rice paper shows up in the Chinese grocery? Of course not. Rice paper has no taste that I know of. I’ve never nibbled one by itself. But we Mexicans go ga-ga this time of year over flor de calabaza, a tasteless and (when cooked) visually unremarkable product. It’s a manifestation of our incredible nuttiness. Yes, but before they’re cooked they’re really pretty and the presentation of a plate of stuffed, fried squash blossoms is gorgeous. But, yeah, there are a lot of incredible nuts down there. Done, but that’s not nitpicking. You have standards. That’s good. Loulou: You’d make a superlative Mexicana! Yes, before they’re cooked they are really pretty. But once fried, their only beauty would be in the eye of the beholder, not on the plate. And they have no taste. Here’s a photo of a plate of fried ones. They could be fried anything. OK – you don’t seem very busy right now. Go to your browser and type in ‘photos of beautiful stuffed squash blossoms’ and look for pimento-stuffed zucchini blossoms. Don’t tell me those aren’t cute. Plus there are boatloads of other pretty ones. Loulou: They are cute. But the blossoms are still tasteless, and most preparations end the cuteness to boot. Brent: Yes, they grow the squash/pumpkin, and I imagine they eat them too. Truth is, I don’t know exactly what sort of squash produces these flowers. Guayabitos, eh? Well, that proves you are Canadians who are the primary foreign tourist group there. Far more Canucks than Gringos in Guayabitos. Just been there once myself. Not a big fan. I prefer Zihuatanejo. If I ever go back, doubtful, I’ll be sure and avoid Wan’s. Thanks for the warning. Here on my mountaintop, you can get pretty good burgers, though I rarely order them due to health concerns. I’m not svelte for no reason. As for my wife’s cooking flor de calabaza, it’s just for her customers. She sells pastries and pies on the plaza once a week. She also knows it’s tasteless. But people buy the silly stuff. We didn’t like Guayabitos either but we thought we’d try the west coast once and some friends were going so we checked out a few places north and south of PV. Haven’t tried Zihuatanejo. I’m curious. Are Canucks not Gringos ? I always thought I was one. Brent: Canucks are Canadians, which I imagine you know, being one. Gringos are Americans, which is another country, which I imagine you know too. You’ll hear lots of nonsense (from Gringos) about Gringos not being just Americans, that they are this, that, whatever. But to a Mexican, a Gringo is an American. Some confusion can enter the equation because Canadians and Americans look exactly alike to Mexicans (and to you and me too), and sometimes even Europeans will look American to Mexicans, but when a Mexican says Gringo, he’s thinking American, period. He may mistake another nationality for Gringo, but he’s thinking American. And when a Gringo is not within earshot, all Mexicans refer to them as Gringos, nothing else. They never, ever say norteamericano or estadounidense. They reserve those words for when they are talking within earshot of a Gringo they don’t know well. They will even say Gringo to a Gringo if the Gringo is someone they do know well. My relatives and other Mexicans I know call me Gringo. And it’s not a pejorative term. Many Gringos will tell you it is, but it’s not. Even Gringos who live in Mexico refer to themselves as Gringos. Zihuatanejo is a great place, the original Zihua. The manufactured Ixtapa, legally part of Zihua, just over the hill, is another matter altogether. I prefer the old town and its beaches, especially Playa Ropa. Thanks for clearing that up. I had no idea. Well, it seems that certain people are genetically able to taste some things that others cannot. About twenty years ago, there was a problem with Chinese food. It had a sort of barn yard flavor to it. I could taste it, and it was horrible. Horse pee! My wife couldn’t and one son couldn’t. This caused a lot of problems. The Chinese were oblivious to this issue. Finally, they traced the problem down to bamboo shoots. If they came from somewhere other than Thailand, they were fine. Señor Gill: So those damn Thais were the problem! I’m not going to contradict you, but I’m surprised you are confounding “tasteless” (lacking in taste) with “flavorless” (lacking in flavor). Taste as a noun means something other than flavor. So consider yourself warned by the grammar or whatever police. Where we get too much opportunity to do this sort of thing. Kim: Sorry, ole bean, but the dictionary I use — Collins Online — says my use of taste/tasteless is quite correct. And so is yours. Don’t get uppity with me anymore, or we may fall into fisticuffs. Well, you may not be incorrect, strictly speaking (and I have my doubts), but your use of tasteless is certainly much more ambiguous than flavorless. Tasteless seems much more used to mean a lack of taste, not lack of flavor. Kim: You’re a funny fellow. When I write that flor de calabaza has no taste, I doubt anyone thinks I mean it’s wearing a striped blouse with checked pants. And a totally inappropriate handbag. Note that most (if not all) of the flor de calabaza sold in the markets hereabouts are *male* squash/zucchini blossoms. The *female* blossoms have a fleshy ovary center that, when pollinated by pollen from the male blossom, eventually develops into the fruit. They are more perishable and more difficult to prepare, but plumper and tastier than the more plentiful male blossoms. Dancing dog: Thanks. I am sure it would be tastier than the male version because I don’t think the male version (I was not aware of these distinctions) has any taste whatsoever. Here’s another scathing exposé: pescado blanco has no flavor of its own. Don Cuevas: Aha! Interesting. Did not know that. Strangely, since it’s a big deal in these parts, I don’t think I’ve ever eaten pescado blanco. Basically, I’m not much of a fish fan.